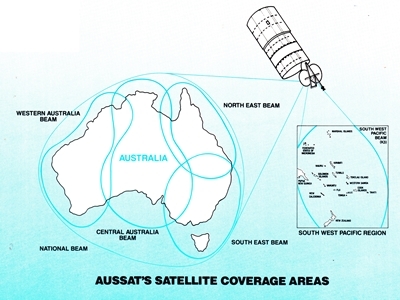 Australia’s domestic communication networks entered the space age 30 years ago today, with the launch of the Aussat satellite. 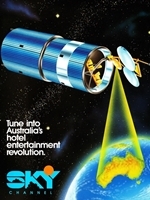 The concept of a domestic satellite was first raised in 1977 with a proposal from Kerry Packer‘s Australian Consolidated Press, owner of TCN9 Sydney and GTV9 Melbourne. Packer, who at the time was masterminding his rebel World Series Cricket competition, was said to be frustrated at the lack and cost of carrier network infrastructure and the fact that he could not get national coverage of his new cricket code. His idea for the satellite was to allow for the metropolitan networks to have Australia-wide coverage or to give regional viewers, most of whom had access to only ABC and one commercial station, access to a second commercial service. There were also wider concerns that a significant number of Australians, particularly in remote areas, were deprived of basic communications services — even just having access to an ordinary telephone in some cases — and that Telecom’s land-based infrastructure was inadequate for the nation’s future communications needs. And at a time that Australia was converting to colour television it was estimated that as many as 300,000 Australians had still yet to have access to television services, and even more had never seen commercial television. A government task force later released its report recommending a domestic satellite system capable of delivering communications, including radio, television and telecommunications, across Australia. The initial system was estimated to cost around $200 million. 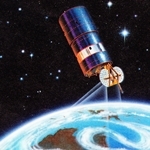 The company to operate Australia’s domestic satellite, Aussat, was created in 1981 — owned jointly between the Commonwealth Government (75%) and Telecom (25%). The Satellite Communication Act 1984 also allowed provision for Aussat to provide satellite communication to neighbouring countries. 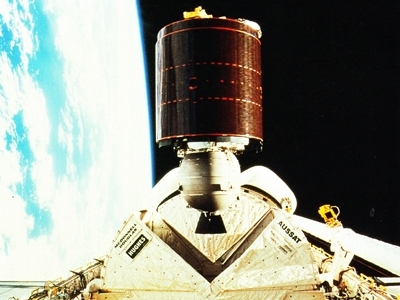 The first Aussat fleet was made up of 3 satellites, constructed in the United States, with the first deployed via NASA’s Space Shuttle Discovery, which launched from Cape Canaveral on 27 August 1985. Aussat 1 is deployed from Space Shuttle Discovery at 3.34am (AEST), 28 August 1985. The second satellite was deployed from NASA Space Shuttle Atlantis three months later. The launch of the third satellite (with capacity to cover the South West Pacific region) was delayed but finally happened in September 1987 from the European Ariane rocket. The system was designed to handle radio, television and telecommunications traffic — including video, voice and data transmission — as well as providing the Department of Aviation with capacity to link all air traffic control centres, allowing improved communications with aircraft. Aussat had established Major City Earth Stations (MCES) in each capital city — though Sydney (pictured above) and Perth were the most significant sites — while the ABC had upgraded some of its technical facilities to handle the additional content being circulated across its radio and television networks. 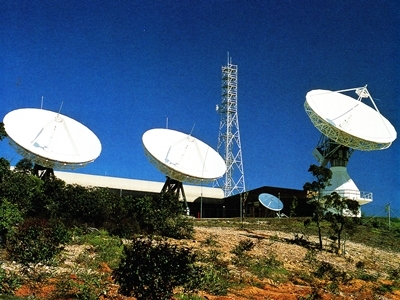 The ABC, as Aussat’s largest customer, started conducting test transmissions via Aussat in October 1985 with the official inauguration of its satellite service on Australia Day, 26 January, 1986. The national broadcaster relayed state-based ABC television and three radio networks via satellite. 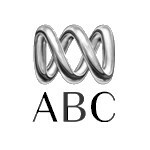 Remote viewers, or even viewers in populated areas with poor reception of normal terrestrial television, could receive their ABC services direct from the satellite if they were not within range of a transmitter. The satellite also provided a reliable means to send ABC’s radio and television networks to transmitter sites across the country. Aussat also meant the ABC could cease its existing remote area television (RATV) service which had operated since 1980 via the international satellite Intelsat. This service was limited in its functionality in that it was a TV-only service to remote areas and was not able to provide a state-based system, with only an Eastern (a composite of ABC’s Sydney and Brisbane stations) and Western service (from Perth). The ABC’s Intelsat relay was officially ceased in December 1985. Then the commercial operators came into play. Bond Media, then owner of QTQ9 Brisbane and STW9 Perth, had used Aussat to launch Sky Channel, aimed at providing sports and entertainment programming to hotels and pub venues across Australia. Sky Channel found itself with two competitors, Club Superstation and Sportsplay, both with their own sports and entertainment program offerings. Bond Media ended up buying the rival two channels and merging them with Sky Channel — now owned by Tabcorp and known as Sky Racing. 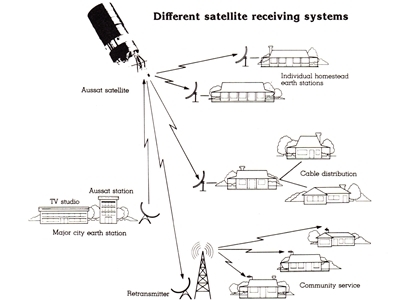 Aussat also had the ability to provide commercial television services (RCTS) to remote areas, many of which had never had access to commercial television before. The first RCTS to commence was a satellite relay of the Golden West Network (now GWN7) to cover the entire state of WA outside of Perth. In January 1988 RCTS was expanded to central Australia with the Alice Springs-based Imparja Television covering Northern Territory and South Australia. In April 1988, QSTV (operated by Townsville-based NQTV) provided a commercial TV service to remote Queensland. Like the regional television structure at the time, the RCTS stations each broadcast a mix of programs from all three metropolitan commercial networks. One of the first major TV productions to come as a result of Aussat was Australia Live, a four-hour look at Australia and its people, produced by ABC, SBS and the Nine Network, in association with regional networks. The program, aired on New Year’s Day 1988 to kick off the year-long celebration of 200 years of European settlement in Australia, was a huge technical exercise with Aussat linking the Sydney-based hosts with reporters situated all over the country. It was a technical feat not possible before Aussat. Aussat was sold to Optus in 1992. The telecommunications carrier still owns the fleet which now comprises six satellites. Source: Canberra Times, 28 September 1978. Sydney Morning Herald, 16 November 1983. ABC Satellite Program Guide, ABC, September 1985. Canberra Times, 19 January 1986. Sydney Morning Herald, 4 May 1986. The Age, 12 October 1987. Sydney Morning Herald, 5 November 1987. 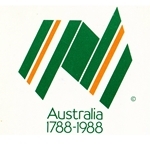 1984-85 Annual Report, Aussat Pty Ltd. Year Book Australia 1988, Australian Bureau Of Statistics. Optus. 1 July 2012 Happy 80th Birthday, ABC!